Southwick is the only pure sand track on the Lucas Oil Pro Motocross circuit, however the track has a hard base that makes it deceptively slick in spots. Sandy or hard, though, everyone agreed it was rough--Mike Alessi said it was the roughest he'd ever seen Southwick (Mike has raced there since 2005) and Malcolm Stewart said it was the roughest track he'd ever ridden on, ever. Race winner Ryan Dungey? He said it was rougher than usual and of course thought that was awesome. Weather was a factor once again. Last year's race was visited by Hurricane Irene, and this year a tornado touched down on Friday in Connecticut, about 45 minutes from the track! It also rained through most of Friday and on parts of the day Saturday, until the clouds finally parted for sunshine by the time the first 250 moto started. Then it became more hot than humid. You can't win at this time of year! 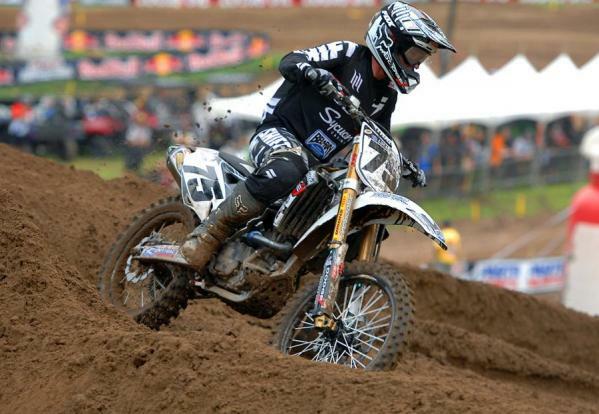 Davi Millsaps was back in action for the JGR/Toyota Yamaha MX team. He tore ligaments in his ankle (doing jumping jacks!) a few days before the RedBud National. He'd only been on a bike for three days before Southwick, but the team needed a rider since they decided to part ways with the underperforming Kyle Regal. Millsaps rode well, taking fourth overall in the 450 Class. Davi Millsaps was back in action at Southwick. As for Regal, he was there on a privateer Yamaha backed by his old buddies at Merge Racing, but he still struggled, with 17-32 scores for 22nd overall. The FMF KTM off-road team no longer competes in the WORCS, so Mike Brown has had some extra time to race Lucas Oil Pro Motocross. He finished a very impressive sixth overall at Southwick, a track where he has won motos before. Brown is doing so well in his National MX outings this year, KTM should just make him a full-time moto guy again. His west-coast off-road teammate Kurt Caselli was able to join him, too, racing his first-ever AMA National. Wearing #766, Kurt just missed scoring points, with 25-24 scores in the 450 Class. Another jack-of-many trades has been racking up some strong results lately. Kevin Rookstool, who also races the AMA EnduroCross Series, went 14-12 for 13th in the 450 Class. Horrible day for Justin Brayton, who had early falls in both of his motos and several more problems, relegating him to a woeful 25th overall. 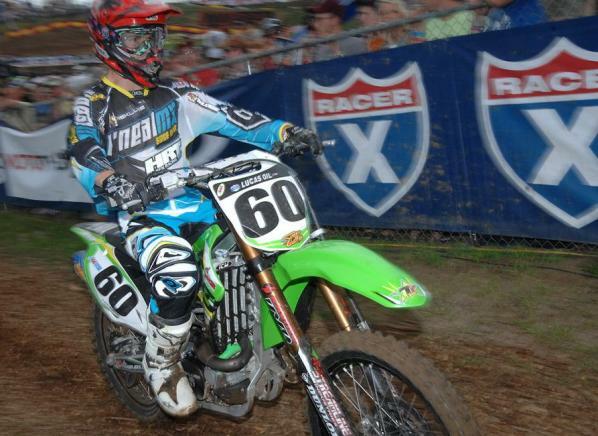 Just a few races ago, Brayton took second at RedBud! After crashing out of his debut race with Star-Valli Rockstar Yamaha, Canada's Cole Thompson had a better day at Southwick and finished 15th overall in the 250 Class. Josh Hill would spend the night in the hospital after a second moto crash. Luckily, initial reports are that Hill will be okay. Long-time Southwick favorite Tony Lorusso raced the 250 Class at his home track on a Suzuki, and finished 17th via 15-17 moto scores. Old Southwick sand masters never die! And of course there's John Dowd, who needed 15 points to score 25 for the year and hold onto a two-digit national number for what we believe would be the 1,732nd season. He finished a solid 10th in moto one, but in moto two he crashed, and then crashed again trying to pick his bike up. He rallied back to 16th, giving him just enough points to hold onto the number. 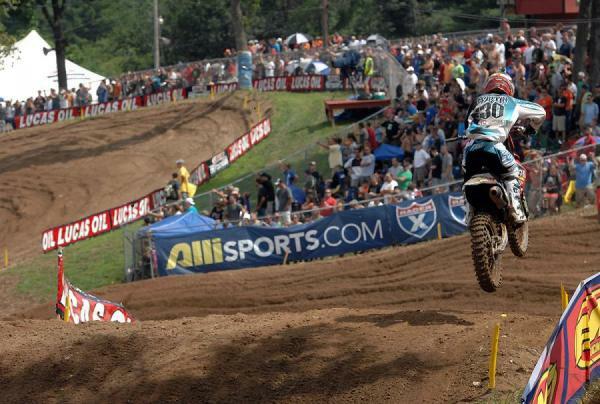 But,no worries, because Dowd says he's coming back for Unadilla! Phil Nicoletti made his 450 debut at Southwick after parting ways with Eleven10 Mods during the break. Nicoletti, who had previously competeted in the 250 Class, ran as high as second early in the first 450 moto but would suffer bike problems relegating him to a 35th place finish. 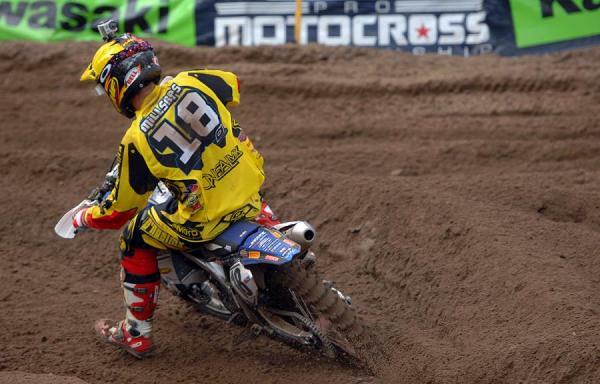 The New York native would bounce back in the second moto, finishing 13th to secure 20th overall in his debut. Alex Martin had seasons-best finish at Southwick. Meanwhile, Nicoletti’s former team (Eleven10 Mods) once again enjoyed the fruits of labor at Southwick. One year ago Alex Martin splished and splashed his way through monsoon conditions to secure the team's first career moto podium. But 2012 provided the team with new-found exposure after Mike McDade pulled a seizing hot bike off Wil Hahn after a second turn pile-up (read more about it in this week's The Moment). Lost in the spotlight was Martin, who once again shined at Southwick with a seasons-best race. Martin would finish 7th overall via 8-6 moto scores. Congrats to HRT Racing’s Cole Martinez and privateer Chris Canning for scoring their first points of the season at Southwick. Martinez, racing in the 450 Class, finished 20th in the second moto, while Cannning, who was competeting in his first 250 race of the year finished 19th in the first moto. Speaking of HRT Racing, their top rider, Matt Lemoine badly injuired his foot at Southwick when he caught it in a deep rut. We spoke with Matt via text message yesterday and while he was unsure if anything is broken at the moment, he did say his foot is about three times the size of normal. We will update you on Lemoine’s status as we know more. Kill Cliff/Dragon Racing Fuels/Cernics KTM’s rookie Justin Starling made his Lucas Oil Pro Motocross debut at Southwick. After missing the first eight rounds due to an ACL injury suffered at Daytona Supercross, Starling would struggle in his debut going 39-36 for 38th overall in the 250 Class. Recent Loretta Lynn graduate Vann Martin, who actually made his pro debut at his home track—Freestone—had quite the weekend in his second pro race. Martin didn’t get to the track until eight in the morning on Friday, after a grueling day of traveling—he missed his original flight due to traffic, got rerouted, and when he did finally make it to Albany, NY, he had to wait until six for the rental car company to open. Compounding matters, Martin was involved in the second turn pileup in moto one. Martin would fight back from a bad start in moto two to finish 20th, secureing his first career points. A noble ending to a bizarre week for the Texas native. Matt Lemoine suffered a foot injury at Southwick that could sidline him for Unadilla. Langston-Witt KTM had another weekend filled with highs and lows. In the first moto, of their respective classes, both Les Smith and Zack Freeberg faced mechanical issues and had to pull off. That was the low. But both were able to rebound in moto two, as Smith secured his second top ten of the season (10th), while Freeberg finished a career-high 14th. Privateer Shawn Rife, racing in only his third race of the season, finished an impressive 14th in the first 250 moto. Rife would end the day 19th overall after a 29th in the second moto. Iron Man Award of the Week goes to... Bobby Kiniry. The Star-Valli Rockstar Yamaha rider returned to competition at Southwick and promptly went 12-21 for 19th overall. Kiniry would pack up and make the drive across the border to compete in the Canadian Nationals (he splits time between the two) and finish third overall. What a day for the New Yorker.